· With the LED light, possible for the night fly. 360° eversion function for you to experience a cool flying game. · With headless mode, there is no need to adjust the position of the aircraft before flying. A key to return the function makes it easy to find the way home. · With 2.0MP HD camera allows you to take photos and record video. 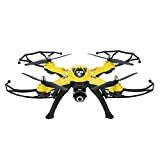 · 6 axis quad gyro, strong stability, easily implement various flight movements.